Vietnam Airlines, the flag carrier of Vietnam, is based in Hanoi. The airline flies to 52 destinations in 17 countries throughout Asia, the Middle East, Europe and Australia. It doesn’t offer flights to North America. Members of the airline’s loyalty program, Lotusmiles, can book award tickets on Vietnam Airlines, its partner Jet Airways and with SkyTeam members. You have to complete at least one flight on Vietnam Airlines or a SkyTeam partner in order to become a Lotusmiles member and redeem miles. The airline does add fuel surcharges to its own award flights, as well as to some SkyTeam members. You cannot redeem Lotusmiles for someone other than yourself unless you have Gold or Platinum elite status. If you do, you can add individuals to your Redemption Group and purchase award tickets for them. The group can consist of up to seven people, and they do not have to be family members. How Can You Use Lotusmiles? Vietnam Airlines has separate award charts for its own flights and for flights on partner airlines, including SkyTeam members. The award chart for flights on Vietnam Airlines is distance-based and has some good redemptions for short- and medium-haul flights. Off-peak tickets start at 7,500 miles per one-way segment. This isn’t quite as good as using British Airways Avios, but Avios aren’t particularly useful when booking flights in Vietnam. Vietnam Airlines domestic peak awards are limited to two weeks a year. Peak periods on international flights, though, are more extensive and depend on the destination. The SkyTeam redemption chart is region-based. Although it’s generally overpriced, there are some good redemptions. If the same route is served by both Vietnam Airlines and a SkyTeam partner, flying on Vietnam will almost always be cheaper. Lotusmiles does not offer a miles-plus-cash award option, but you can top up your account by purchasing miles at $25 per 1,000 miles, including taxes and fees. Redeeming miles for expensive flights on Vietnam Airlines will give you the best value. Those typically include domestic flights in Vietnam and short-haul international flights. 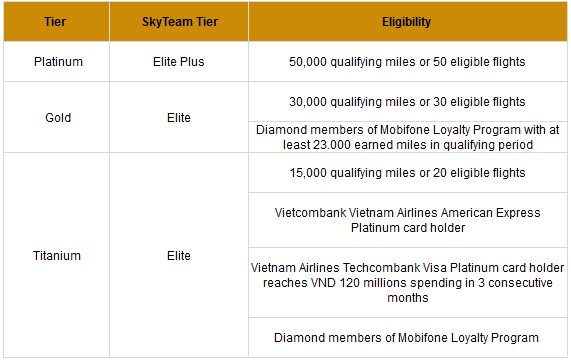 There are some good redemptions in Vietnam Airlines’ SkyTeam award chart, too. The airline considers Hawaii to be part of North America. That means that you can fly roundtrip between the continental U.S. and Hawaii for 30,000 miles in economy or 60,000 in business on Delta. There are no fuel surcharges on flights in the Americas. Round-trip flights between North America and Europe or South America are also a good deal at 50,000 miles. The same flight costs 60,000 miles if redeemed with miles from any of the three major U.S. programs. The most expensive tickets in the Lotusmiles award charts are for a premium class seats between the U.S. and Australia, New Zealand or the Pacific Islands. A round-trip business class seat on one of these routes costs 200,000 miles, while first class tickets are 300,000 miles. But the most expensive award ticket is for first class between Africa and South America. It costs an unbelievable 360,000 miles. You can upgrade your cash ticket with miles on Vietnam Airlines flights. You can upgrade from economy or economy plus to business. An upgrade for a flight between Hanoi and Ho Chi Minh costs 13,500 miles. Lotusmiles has three elite levels, in addition to a basic Silver status. Each level includes the perks of the previous level. There are no U.S.-based Vietnam Airlines credit cards currently available.